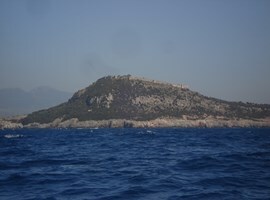 Ancient Pylos, as it’s reported by Pausanias, is in Koryfasio (6klm. at the northwestern part of the recent town) and was built and inhabited by the mythical Pylos, who came with the Leleges from the town of Megara. Later, they were expelled from Nyleas who came with the Pelasgians from the town of Iolcos in Thessaly and built a new town with the name ‘’Helian Pylos’’. After the Messenian War, Pylos declined until the 371BC when was rebuilt by Epaminondas giving it the name Koryfasio. Later the town was inhabited by the Romans (589BC), the Eurasian Avars who named it Avarino and the Navarrese Company who came in the 13th century with Nikola Saintomer and named finally the town Navarino. In the 14th century, the town was depopulated and the Franks built at the mouth of the harbour a new castle, which was occupied by the Turkish in 1498. On the 20th of October in 1827, the fleets of the British, French and Russians defeated the Turkish fleet of Ibrahim while the famous naval battle of Navarino, marked the victorious end of the liberation fight and the definitive independence for Greece. 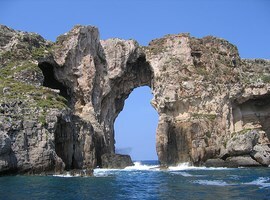 Polihni is the name of Ancient Pylos in our days. It’s a beautiful town, with an intense insular colour; two-floor white houses with gardens and flowers, a great history and a particular architectural plan. In the town, they have been discovered a lot of- great value- archaeological treasures. 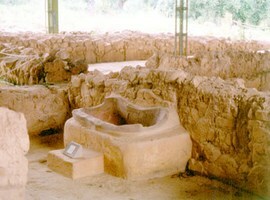 Stone walls, parts of wall paintings and floors, Mycenaean jars, and many others. 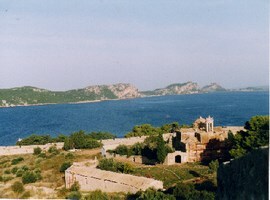 The ancient town of Pylos was very important during the Peloponnesian War. From the acropolis, someone can notice indications of the presence of the Early Christianity and the Hellenistic Era. Every year, the town attracts a large number of tourists who come to admire this cultural and historical inheritance and also the beautiful places and beaches of the entire Messenian County. The new castle, Niokastro, was built by the Turks in the place of the today Pylos in 1573 and served as a refuelling station of the Turkish navy. In 1686, it was occupied by the Venetian Doge Francesco Morozini, and belonged to the Venetians until the 1715 when was again occupied by the Ottomans. On April 15th of 1770, the castle was occupied by Alexis Orloff, to be abandoned on the 6th June of the same year by the Russians, after the failure of the project. It was surrounded by the allied fleet at the Battle of Navarino in 1827 and after its occupation was laid down to the Greek representative, General Nikitaras. The area of ​​the acropolis was used in the 19th century as a prison for long-term convicts and during the World War II as the seat of government for the Italians. Since 1953, the castle belongs to the archaeological department of the Greek State. Today the castle has a perimeter of 1566m. and spreads over an area of ​​80 acres. Entering the castle from its now unique entrance, there is a room which hosts a rich collection of paintings, consisting of historical snapshots, portraits and lithographs from the revolutionary period which were an offer of the great Philhellene Rene Pio. Inside the castle there is a church built by the Franks and has a gothic style. During the Ottoman occupation, the castle worked as a mosque and after the liberation changed into an Orthodox church. Today, Niokastro is considered to be one of the most preserved castles in the Greek territory. 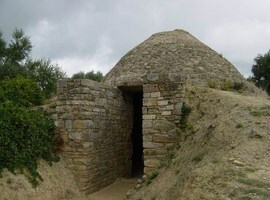 North of the castle is located an arched tomb of the first Mycenaean period (16th century BC) which is attributed- according to Pausanias- to the son of Nestor, Thrasymedes. 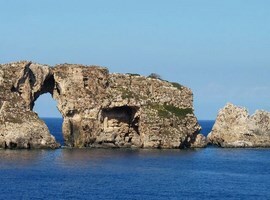 This small island is located in the Gulf of Navarino and one can visit it only by boat. In the place is hosted a large number of ancient monuments. On the northern side, on the hill of Prophet Helias, there are some objects of historical significance from an ancient wall, since the Peloponnesian War. On the southern side of the island, there is the cenotaph of the Greek fighter Anastasis Tsamados, who were killed during the battle of Sphacteria in 1825. In the same area, is located the grave of the prince Paul Marie Bonaparte, the nephew of Napoleon who came in Greece to take part in the Greek war for independence, and also the grave of the French naval officer, Meye who were killed in the battle of Navarino. Nestor was an Argonaut and one of the kings of Pylos. His palace was discovered after the World War II and is one of the most important monuments of the Mycenaean Era in Greece. 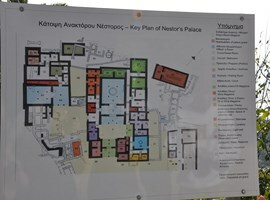 It was built by Nestor in the 13th century BC who fought in the Trojan War and made Pylos the second most important city of the Mycenaean world after Mycenae. 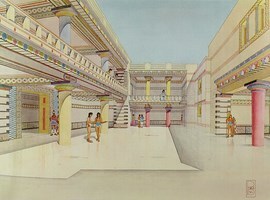 The palace was destroyed completely after a fire in the 12th century AC and was never rebuilt. The excavations gradually uncovered the ruins of a really rich two-floor main building and two other comforting. 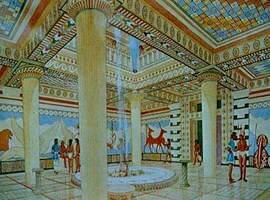 The room of the throne was beautifully decorated with colourful wall paintings which were showing various themes while a painting decoration existed on the floor of the room. 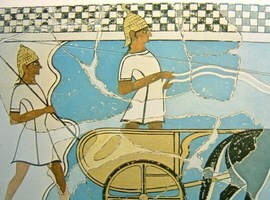 When the palace of Nestor was discovered, a lot of valuable objects came to the light with it. Ceramic jars and inscriptions with the first Greek language, the Linear B. From the entire area around the palace were excavated ached tombs with grave goods while the closest of them was found 80 metres away from the main palace.